Paris is smaller than you think. On one three-day visit I traipsed the entire city without ever taking the metro. But it’s also enormous, because everything in the City of Lights exists on a grand scale. Everything has significance. It all has purpose. And on your long weekend in Paris, so do you. You’ve got to see as much as you can, to bottle up the history and the food and the charm in a few short days. So where do you even begin? Paris’ metro sprawls every which way, as do its attractions, so the perimeter of quality hotels expands quite generously from the center. (It’s also surprisingly walkable, as you’ll learn.) 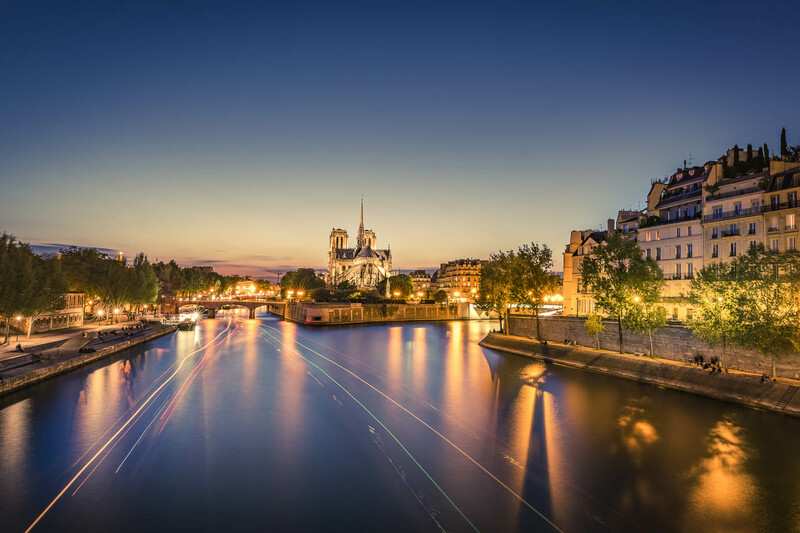 With all this in mind, target the right bank, north of the River Seine. Stay between L’Europe to the west, in the 8th arrondissement, and Le Marais to the east, in the 2nd and 3rd. The 20 arrondissements of Paris start at the center (1) and spiral clockwise to the outskirts of the city. They aren’t easy to pick out unless you’re looking at a map, but in direct terms, you should target the 1st, 2nd, 3rd, 4th, 8th, and 9th. There are also options. Paris boasts top-shelf hospitality, so it’s hard to know what’s excessive and what’s worth the dollar (or euro, as it were). Among the five-star hotels, I suggest Les Bains and Grands Boulevards. There’s something soothing about my other favorite, Grands Boulevards. It soaks up every ounce of stress that a big city—or even traveling—can throw your way. While its decor is a nod to the grandeur of revolution-era Paris, it still feels modern. I love the block colors in each room, the texture of the walls, the furniture. Rich detail drips from every corner of the hotel, and its bustling dinner-and-cocktail crowd rivals that of Les Bains. Spoil yourself with a suite—it won’t break the bank, at least in comparison to a New York hotel, or other ones in this city—and soak up the splendor in a two-person bathtub and Parisian rooftop-views. If five stars isn’t your first priority, you can still soar over your expectations with Le Belleval, a newly opened four-star gem. It has fewer frills, but the rooms are every bit as relaxing, and the hospitality world-class. It’s still got a sauna and fitness center, and I love that its on-site restaurant/café are the perfect makeshift office. You get a Parisian café experience while you punch away at your Macbook, but it’s quiet enough to take a work call, too. The Eiffel is, of course, cool to see by day. But there’s often construction around the base, and the daytime crowds are more touristy and sweaty and agitated. Paris’s signature landmark is much more serene at night, when you can block out the distractions and revel in its sparkling lights (which glow for five minutes every hour, on the hour). You’ll not forget this moment. You can’t come to Paris without visiting a couple museums—even if “art isn’t your thing.” It’s too easy to tell you to visit the Louvre. 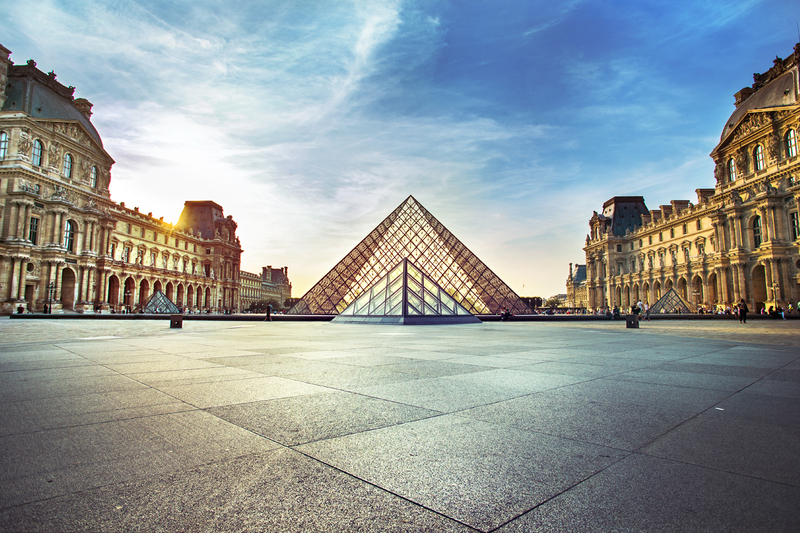 Of course, your itinerary for the day could be just the Louvre if you wanted it to be. It is, after all, the biggest art museum in the world. But because of that, your experience might feel less curated, and it runs the risk of feeling more like an obligation instead of an enjoyable experience. So if art is in fact your thing, go crazy. Or if you want to see the Mona Lisa and dip, be my guest. Here’s my suggested alternative: Start with a classic French breakfast at Le Café Blanc near the Louvre. Walk past the Louvre, since the outside is just as remarkable. You’ll see the glass pyramid and the expansive view towards Jardin des Tuileries to the west, and the Palais Royal to the north. 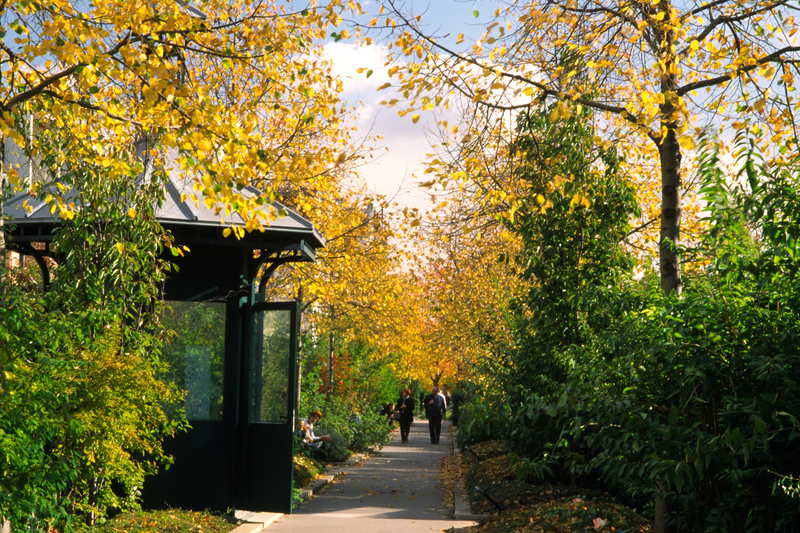 Walk across the gardens and stop instead at Musée l’Orangerie, which centers on Impressionism (Monet, Modigliani, Picasso, Matisse, Renoir, Cézanne). It’s perfectly digestible, and will feel far more relevant than the massive, expansive Louvre. You’ll especially love Monet’s eight water lily murals, which hang in the round inside two beautifully lit rooms on the ground floor. Follow l’Orangerie with a short hike across the river to the Musêe Rodin and gardens (you can buy a cheaper ticket just to tour the garden, which features the sculptor’s best works, including The Thinker). You’ll also be near Musêe d’Orsay, a rail-station-turned-art-museum, which has an enormous Impressionist and post-Impressionist collection. All together, these are Louvre lite, in the best way possible. Walk to Relais de l’Entrecote St-Benuît for some killer steak frites. Walk back to earn your calories. 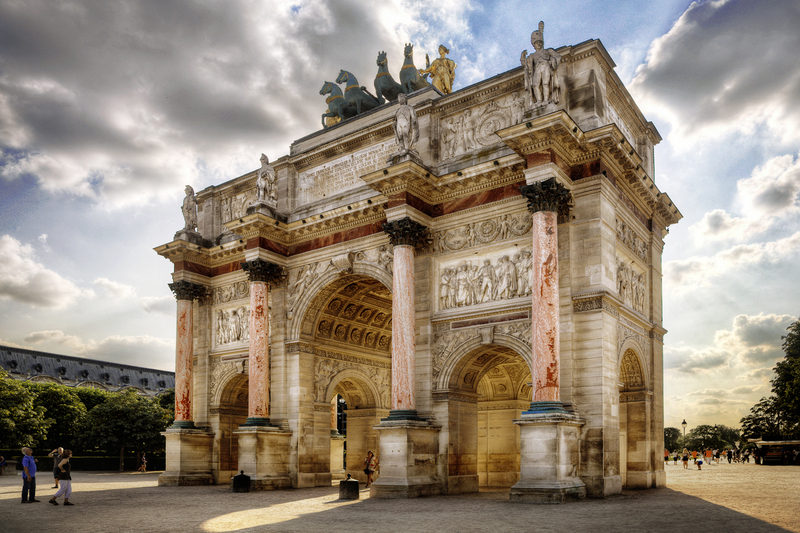 Then, go back up to Tuileries and walk west along the infamous commercial avenue, Champs-Élysee, all the way to the Arc de Triomphe. You’ll find plenty of stores to turn into. Or you can beeline past the crowds to the finish line and photo op. After freshening up, take the metro to Loup (not far from your starting point for the day), and order the 120-day raised rotisserie chicken. Then, you’re off to your reservations at Moulin Rouge in Montmartre or Crazy Horse near the Arc de Triomphe, both banner French cabaret experiences. Skip the dinner specials and book the late show at either venue, so you’re not in a rush. Start with a late-morning walk through the farmers market Marche des Enfants Rouge in Le Marais. The food vendors arrive at their own paces, so it’s best to arrive at 10 a.m., or later. Then—and this is a little random—take a tour of the nearby Musée de la Chasse et de la Nature (the Museum of Hunting and Nature). It’s niche, but it’s fascinating to see all the taxidermy and old-timey hunting weapons that they’ve gathered. Plus, it’s a nice change of pace from the more public art museums with throngs of tourists. You had a late breakfast, but top off your appetite with lunch at The Broken Arm, a café attached to a men’s and women’s boutique. (Spend some minutes perusing the latest collection, why don’t ya?) The menu rotates daily, which means you’re getting something fresh and in season. Get a bite at your hotel, but save room for a street-vendor Nutella crepe in Montmartre, where you’ll start the day. Meander the side streets of the hilly artist ‘hood, directing yourself to the portraitures of Place du Tertre (it’s costly, but you’ll get a great memento if you pay one of the buskers for a drawing), and the picture-ready Le Moulin de la Galette, which is both a restaurant and a tourist attraction. (Windmills—moulins, in French—once peppered the hills of Montmartre, but now only this and Moulin Rouge remain. Then, walk to the century-old Sacré-Cœur Basilica for a panorama of the city (though the Eiffel is barely cut out at the right). This is the highest point in the city, so it’s well worth the uphill trek to experience the view. 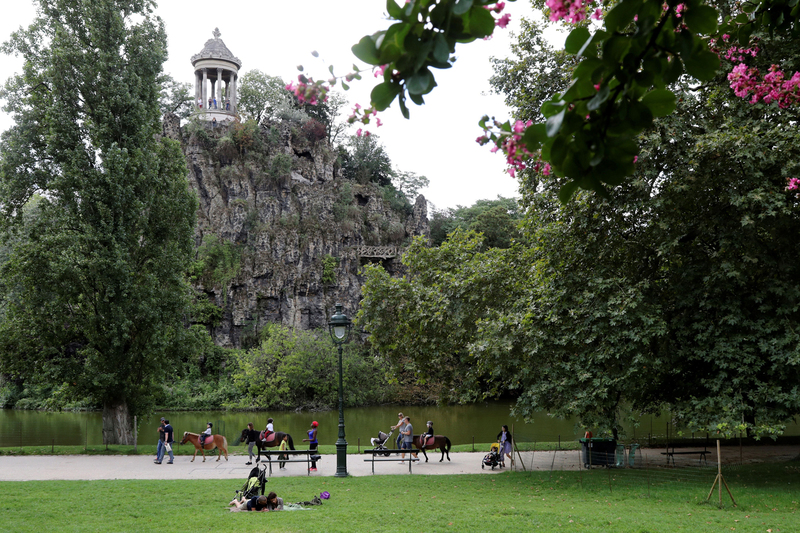 Hop the metro to Parc des Buttes Chaumont, my personal favorite park in the city. At the center you’ll see a Roman pavilion-style temple, atop a luscious island butte, surrounded by a lake. (Read that again, slowly.) It is ethereally beautiful. You can lounge by the lake, or on the hills overlooking the city, or you can take photos from the temple itself. Pass a couple hours here—wine and cheese lunchtime picnic, perhaps?—and soak up the splendor. If you’re still hungry after, head to Extérieur Quai Bouillon de l’Est for oysters and white wine (if you’re in town on a Wednesday, those oysters are 1 euro each, and the wine less than 10!). Depending on how much time (and energy) you’ve got, now might be a good time to take a quiet walk through Père Lachaise cemetery, which closes at 6 p.m. You might know it as the place where lipsticked people kiss Oscar Wilde’s tomb (though it’s protected by glass barriers, now). This massive cemetery in the heart of the city is home to one million souls, and many mausoleums as impressive as the city itself. Frédéric Chopin is buried here, as are Honoré de Balzac and Théodore Géricault. Even so, some of the more modest graves here belong to the biggest names: Jim Morrison, Marcel Proust, and Édith Piaf. Find them! You’ve been a fancy boy all weekend, so take it easy on the wallet and attitude with Sette Pizza in Le Marais. It’s cozy, it’s cool, it’s cheap, and they’ll be spinning some incredible music, too. You’ve seen a lot this weekend. And there’s still plenty more to do on your next visit—a visit to the chateau Versailles or weirdly futuristic business district La Defense chief among them. (The Louvre is still optional.) For this trip, however you’ve checked a lot of boxes. This morning is about soaking up Paris from the outside, and savoring it. I suggest you head to the Bastille roundabout—that’s a monument that celebrates the 1789 French revolution—then meander from there to the Coulée verte René-Dumont, also known as Promenade Plantée, a stunning viaduct walkway not unlike New York City’s High Line park. (It’s considered the inspiration for the Highline, in fact.) It’s walled in by bushes, trees, vines, and flowers, with lots of nestling nooks and rooftop views of Paris’ 12th Arrondissement. Take a deep breath—there’s plenty of oxygen here to inhale—and stuff a croissant in there while you’re at it.